School’s finally out and Ling and her friends head for a beach holiday looking forward to fun, excitement and exploring the derelict lighthouse around the bay. They soon find out, though, that their holiday destination was the scene of a tragic boating accident years ago. At night, Ling is haunted by the image of a girl who whispers words, then fades away. During the day, a gang of hostile local kids searches the island for lost treasure. And in the background, the story of the orphanage and the children who lived there threads its way into the mystery. Attempting to find out the truth from the locals only leads to frustration … and raises more questions. Why is Ling the only person who can see the ghost? What really happened all those years ago on the island? And why has the man who ran the orphanage-the frightening Mr Jamison-returned to his home town? 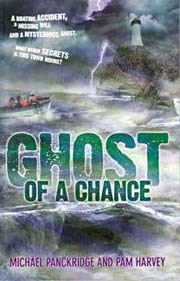 Ling and her friends must brave stormy seas and stay one step ahead of the other kids in a daring mission to uncover the truth and help restore peace to those who have been left behind.